The evolution of innovative input devices is far from over. New technologies and products are revolutionizing the market all the time. Jens Kautzor | Hoffmann + Krippner Inc. The membrane switch originated from technical screen printing. Initially, the printed membranes were used simply as decorative elements to increase the appearance of conventional switches or as a cover for short-stroke keys. The first real membrane switch came to market in the early eighties. The original material used was Polycarbonate but it was dismissed in respect to material brittleness caused by poor mechanical deformation properties, resulting in cracks around the keys. Initially only membrane switches without any tactile feedback were available. It was not possible to calculate the exact distance between layers and therefore the switching behavior was rather poor and resulted in a lesser grade quality. By using polyester as a base material and changing the membrane switch design in regard to composition and structure, the quality problems of the early years were largely eliminated. In the late eighties the first membrane switches were fabricated with domed keys, introducing metal domes for improved tactile feedback and longevity. Caption: Integrated metal dome to provide tactile feedback. Another big step in the evolution of the membrane switch was the introduction of LED technology. First used simply for backlighting keys, LEDs today offer a wide variety of interesting and effective display options for membrane switches. The biggest breakthrough, however, was the increase in switching cycles to over 1 million operations by using gold plated metal snap domes. With unquestionable advantages such as high flexibility in design, low profile and a wide range in IP rating options, the membrane switch has become the input standard for many industries. Through the years the membrane switch turned out to be a real integration miracle. The direct mounting on printed circuit board allows for much more compact designs. The back of the keyboard can be fitted directly to a custom circuit. Display, touch screen, mouse pad, analog potentiometer - all these elements can be implemented very easily. Capacitive and resistive technology can be combined with conventional mechanics. LED and EL films allow the illumination of single keys or full areas for visual feedback, as night lights or just as a design element. The design possibilities are virtually unlimited. Today’s popular capacitive touch technology, commonly used with smart phones and tablets, uses a glass surface that is resistant to acid, dirt, hazardous chemicals and other impurities. 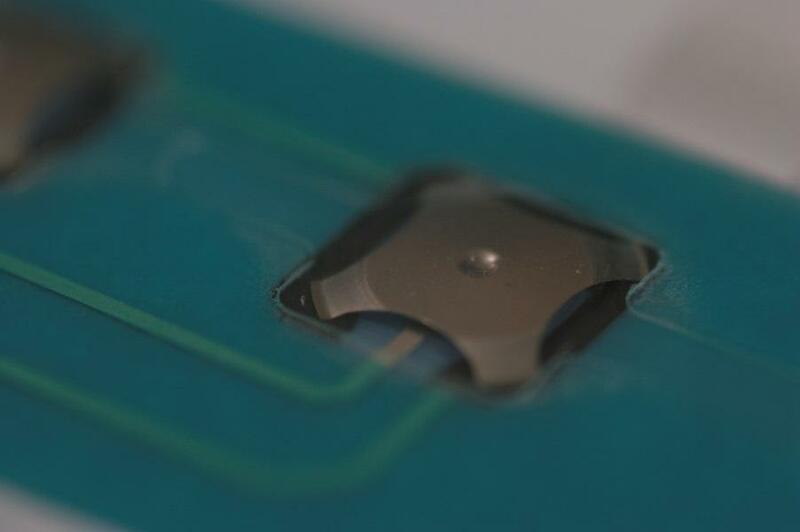 As there are no moving parts, the result is no mechanical wear of the contacts. Cleaning is easy and ensures maximum hygiene standards. The lack of tactile feedback of a touchscreen can be overcome by optical and / or acoustic signals. The capacitive technology enables flat design and can be inserted behind glass, plastic or other non-conductive surfaces. There are a variety of challenges involved in designing and manufacturing high quality input devices for the electronics, industrial and consumer industries. Resistive devices require a highly compact design since the domes are already 7mm high. Because of the occurrence of even tiny air gaps which can admit dust, humidity and harsh chemicals, it is critical to properly design the display, filter discs and the capacitive touch solution itself. Especially challenging is the integration of input devices onto curved surfaces. However, with state of the art equipment and engineering, these challenges can be overcome to produce high quality solutions. Placement layers for key domes are also important for durability. A lot of manufactures will just lay the metal domes in place and then stick on a top (decorating) foil. This can compromise quality because the metal domes can move. The membrane switch will fail if a key doesn’t have contact anymore. The metal domes need to be directly over the printed silver contacts. Once in place, they need to be glued with clear placement foil over the domes. The top decorative foil is then adhered over the placement layer. This prevents the domes from moving. This process is an important extra layer of protection that successfully increases longevity. What are the top features that product developers should look for? Product developers should know that an innovative input device has many design options to make their product stand out. This includes illuminated keys, integrated touchscreen, raised (domed) keys, capacitive touch, and optical bonding of touchscreen to the front glass or display. Manufacturers also require long life, with internal components that will not wear out, with a large number of switching cycles. Design engineers should look for a guarantee of over one million operations in a variety of environmental conditions. Optical Bonding is an important technical feature that provides a clear view in bright environments, as well as extra life and user safety. Optical Bonding refers to the bonding of the display with the touch screen, or the bonding of the touch screen with the front glass using a highly transparent liquid adhesive. It can provide a clear and brilliant image, even after years of operation. Optical bonding eliminates air gaps, preventing moisture and dirt from gathering and condensation. Optical bonding also ensures the system is resistant to temperature fluctuations and mechanical stress. Finally, a crack in the front glass will not immediately shatter. It is held together by the adhesive, minimizing risk of injury to the operator. Good operability – IE - good tactile switching behavior is extremely important for user acceptance. The membrane switch technology should be completely sealed and easy to clean with a variety of cleaning materials including fluids. 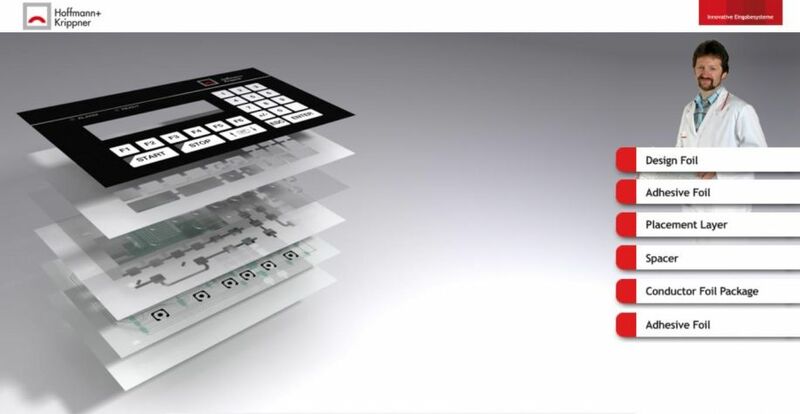 Finally, the membrane switch needs to be easily installable and support a range of connectivity options. The evolution of innovative input devices is far from over. New technologies and products are revolutionizing the market all the time. Just as the above-described capacitive technology, for example, which was long reserved for the electronic gadgets of entertainment electronics, slowly found acceptance in the industry - just like many years ago, the keypad did. 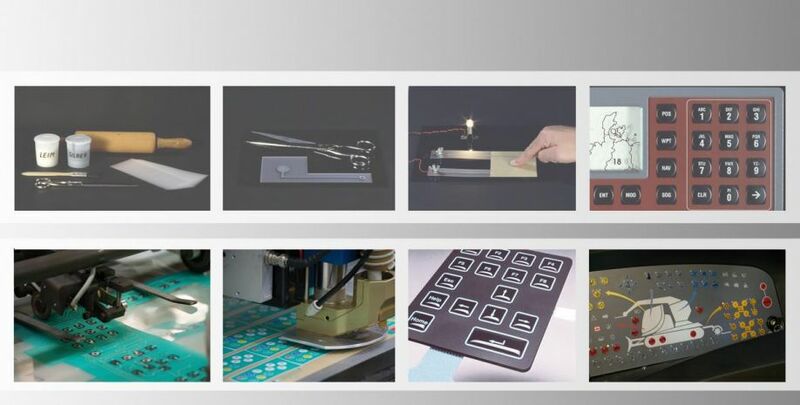 Hoffmann + Krippner designs membrane switches by finding the best combination out of the different technologies available and integrates them into a high quality membrane switch. A placement layer is standard at Hoffmann + Krippner to ensure ultimate longevity. Hoffman + Krippner provides customized design capabilities, perfect front foil print and digital printing capabilities, as well as full vertical in-house manufacturing. 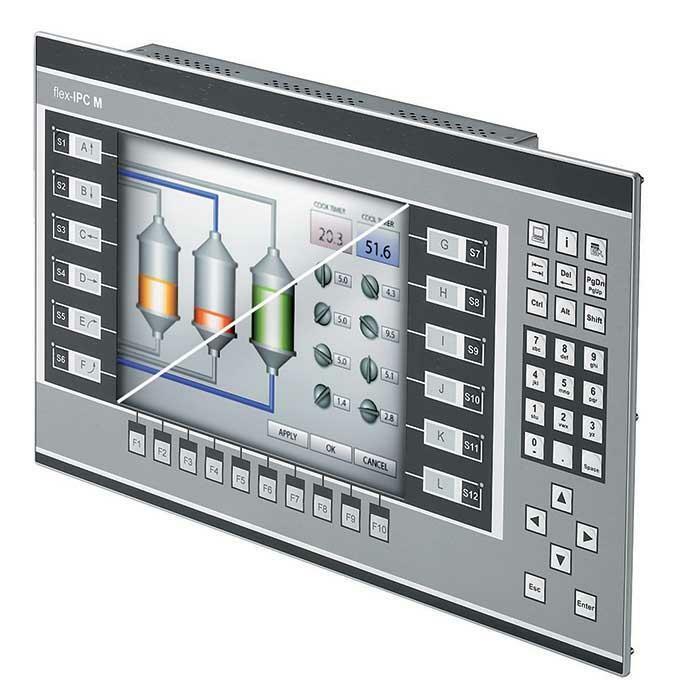 Hoffmann + Krippner SENSOTOUCH foil technologies enable high-performance, reliable and robust touch screen solutions (capacitive and resistive) that fulfill all special requirements of the latest input systems and operating units. The perfect solution for each industry – Hoffmann + Krippner provides efficient, accurate and professional work experience at the highest level for almost every industrial environment. In addition, H+K develops custom resistive and capacitive touchscreen designs according to customer specifications.